Move over Man Bun, the Man Perm is back! Don’t worry this isn’t 1985. Gone are the days of the tightly wound Kevin Keegan bubble perm or Justin Timberlake’s crunchy spirals from 2000, think more of the rugged Jon Snow from Game of Thrones. The science behind the modern way of perming has advanced significantly. Today’s perm produces a much more natural look varying from tousled waves to shaggy curls, tailoring it to suit your particular style. And it’s not just used to create curls; it can give fantastic body and texture to straight hair. Guys have been inspired by celebrities such as Harry Styles from 1 Direction and actor Matthew McConaghy for proudly sporting their curly locks and aspire to emulate the look. And who wouldn’t want to look like them! Lynsey Wilson, head technician at our Frederick Street salon says “we have definitely seen an increase in the number of perms over the past year and recently we are receiving more requests from our male clients”. Pictured is her client Peter and the fantastic results of his perm. 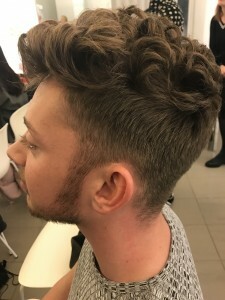 I don’t think this is the last we have seen of the Man Perm (or Merm) so guys, embrace the curl and contact your nearest salon to arrange a consultation with one of our perm technicians.